Thoroughly rinse and roughly chop an enormous amount of spinach (remember spinach shrinks!) you can use a whole bag. Feel free to add any other greens in your fridge: chard, kale, collard greens etc. You can make a quick pickle at this point too! Thinly slice some red onion, some cabbage, some carrots or radishes — whatever is in the fridge!— and cover with plenty of lime juice, a bit of salt and a sprinkle of sugar if you fancy. Set aside. When the potatoes are ready to go, heat up some oil or ghee in a frying pan or wok and sizzle a generous sprinkling of black mustard seeds and cumin seeds. For a spicy curry add some sliced fresh chilis, dried red chilis or even chili flakes or powder. When the seeds start sputtering, quickly add the sliced onions and chopped garlic. Cook on medium/high until the onions begin to brown and caramelise. Add the potatoes and smash them up so they break apart. Sprinkle over a bit of turmeric and stir everything well. Season with plenty of salt. Slowly, one handful at a time, add the spinach until it’s all wilted and nicely mixed in. Simmer for a few more minutes and finish with more salt, lime or lemon juice, and some fresh cilantro. 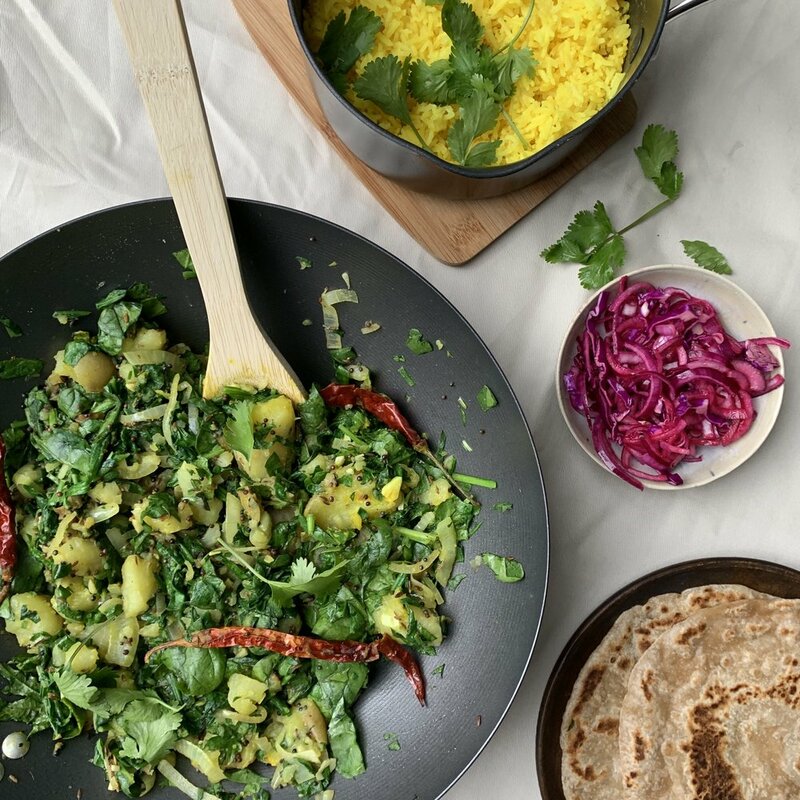 Serve with rice, pickle and if you’re feeling REALLY carb confident — some chapatis!